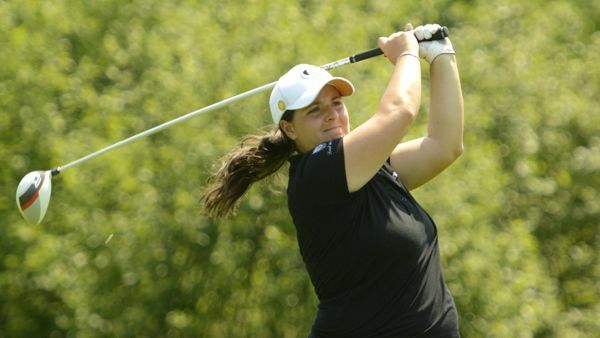 The University of Montréal Carabins regained the women’s division lead, while the University of British Columbia Thunderbirds soared ahead at the Canadian University/College Championship at Club de golf Val des Lacs in Ste-Sophie, Que. On the women’s side, the Carabins overtook the University of Victoria Vikes, who led by three after the second round on Wednesday. The contingent of Sabrina Sapone of Montréal, Caroline Ciot of Brossard, Que., Laurence Mignault of Varennes, Que., and Sarah-Andrea Landry of Brossard, Que., fired a combined third round 6-over 219. The Carabins currently sit at 34-over 673 for the tournament and hold a four-stroke lead over the Vikes heading into Friday’s final round. Heading into the final round, the Vikes have ground to make up after a 16-over 229 in the third round. The Vikes currently sit 17 strokes ahead of defending champions, University of British Columbia (UBC) Thunderbirds. The University of Toronto Varsity Blues sit one stroke behind UBC, while the University of Waterloo Warriors round out the top five. Individually, Sapone leads the women’s division at 6-over 219 after an even-par 71 third round. Through nine holes Thursday, the Montréal native turned at 3-under-par but struggled with her putting over the closing holes. Heading into Friday’s final round she holds a three stroke lead over Vikes’ standout Megan Woodland of Victoria, B.C., who posted a 4-over 75 in the third round and sits at 9-over 222 for the championship. 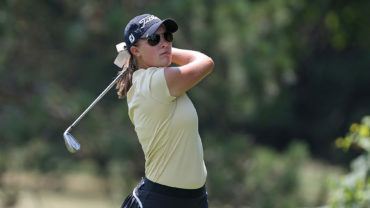 Overnight leader Brynn Tomie of Bedford, N.S., and Caroline Ciot of Brossard, Que., share third place at 10-over 223, while 2012 individual champion Devon Rizzo, carded a third round 3-over 74 to grab solo fifth at 15-over 228. On the men’s side, the Thunderbirds fired a third round 3-over 287 to establish themselves atop the leaderboard. Heading into Friday’s final round they hold a 13 stroke lead over defending champions, Université Laval Rouge et Or. The Thunderbirds’ squad of Conner Kozak of Vernon, B.C., Kieran Standen of Edmonton, Alta., Jerry Christiansen of Air Ronge, Sask., Andrew Ledger of Toronto and Scott Secord of Calgary sit at 13-over 865 for the tournament. Head Coach Chris MacDonald is happy with the way his squads has been performing this week and isn’t planning to change much heading into the final round. “I don’t think we’re going to change a lot, we’ve kind of had the same kind of game plan all week,” he said. “The group is having a lot of fun together and I think that’s the main thing that’s been happening, they’re really enjoying the golf course. “We’d like to be making a few more putts but they’ve kept the ball in play and played a pretty simple game and just been steady this week,” he continued. Trailing the Thunderbirds through the opening nine the Rouge et Or stumbled on the third day, posting 15-over 299 to sit at 26-over 878 for the championship. Humber College posted a second consecutive 12-over 296 to sit in third, while the Université de Montréal Carabins and University of Manitoba Bisons round out the top five respectively. Individually, Laval’s Ugo Coussaud of Angoulème, France remains in the lead after a 4-over back nine on Thursday. 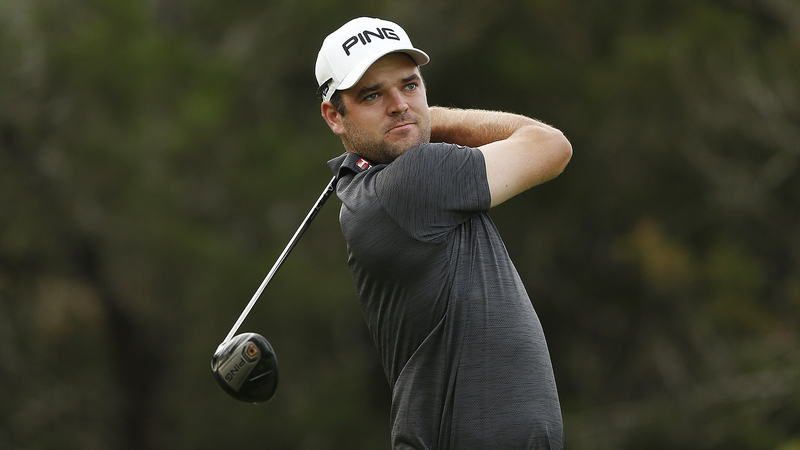 Coussaud sits at 5-under 208, one stroke ahead of Team Canada’s Chris Hemmerich of Kitchener, Ont., who posted a 1-under 70 for the University of Guelph Gryphons. Holland College Hurricanes’ Eric Locke of Digby, N.S., sits in third at 3-under, while UBC’s Conner Kozak of Vernon, B.C., and Hawks’ Alex Dumais of Caledon, Ont., are in a tie for fourth at 1-over 214. Following 54 holes of play the field was reduced to the low 10 men’s teams and low six women’s teams. In addition, any individuals who were within 15 strokes of the lead return to play Friday.